Unless you are reading this from certain counties in Pennsylvania then you have probably never heard of York Water Company (NASDAQ: YORW). After all this little utility stock has got to be one of the smallest I have covered so far. Its annual revenue this year will register around $50 million and it currently sports a market capitalization that is barely over the $400 million mark. 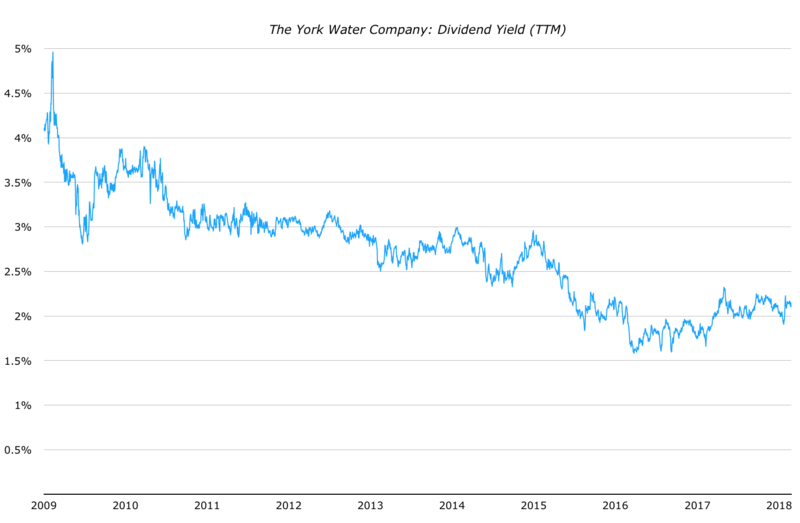 That said York Water Company has one thing going for it that puts it ahead of almost any other stock on the continent: a monstrous multi-century long dividend record. The company has racked up a 203 year streak of consecutive distributions that starts all the way back in 1816. The last time I covered the stock was on Seeking Alpha back in 2017. York shares were trading for just under $33.20 and forward earnings estimates registered around $1.02 per share. That’s right, York’s forward price-to-earnings ratio was a staggering 32x annual profit. Needless to say it wasn’t exactly a screaming buy. Unfortunately it doesn’t look like much has changed since then. As it stands York stock can be bought for around $32 per share. 2018 earnings are expected to clock in at just over $1 per share. What is the bullish case for paying over 30x earnings here? I mean this is a two-hundred year old regulated regional utility company we are talking about. The growth prospects reflect that. Twenty years ago York earned around $0.35 per share in net income. 2018 earnings will probably register somewhere in the region of $1 per share. Compute that as an average growth rate and it clocks in at around 5.3% per annum (which I guess is what you might expect from a stodgy utility). Now let’s play a bit with some predictions over the next couple of decades. Let’s assume for a moment that York replicates its 5.3% per annum average growth rate by periodically adding new customers and raising water prices. By 2040 that would give us earnings per share of around $3.15. 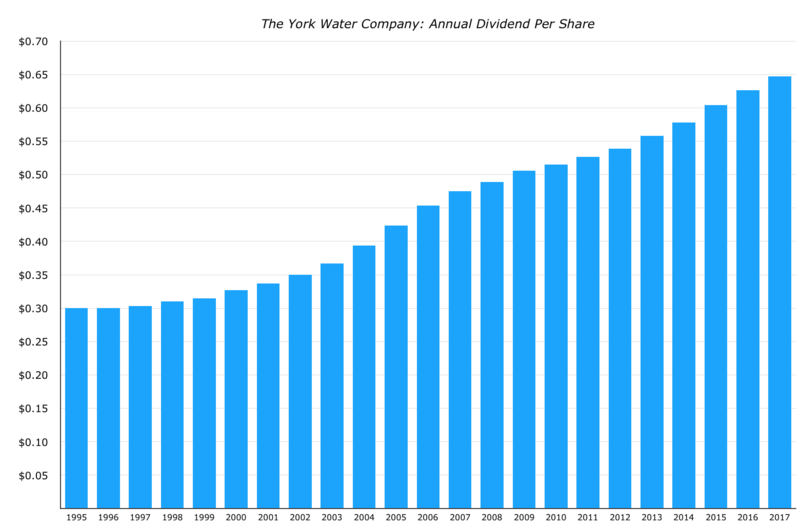 On top of that let’s also assume that York’s legendary dividend grows in the same manner. By 2040 the cumulative cash dividend pile hits $28.50 per York share. Just to scratch out 7% annual returns would require the terminal P/E ratio to be over 30. How many investors are going to sign up to take that kind of risk? Okay, but folks don’t buy a stock like York to get rich might be the counter argument. After all this kind of stock is often all about chunky and reliable dividends. Indeed the world could fall to pieces and I bet York would carry on supplying water at a profit to its 65,000 Pennsylvania customers. However, the income situation doesn’t make all that much sense either. On a trailing-twelve-month basis York sports a yield of 2.1% based on the current share price. Assuming dividend growth matches the recent historical earnings growth of 5.3% it would take an entire decade to hit a yield on cost of just 3.5% at today’s share price. How many income seekers will sign up for that? It is far too low. I mean you can go out right now and get the entire S&P 500 at a broadly similar dividend yield but with the prospect of far superior future growth. For the more income orientated folks a large cap fund of ‘traditional’ dividend stocks might get you a 50% higher starting yield and with similar growth prospects to York. Ultimately whichever way you slice it the stock is still just far too expensive.